At UK Safety, we offer a cost effective service to such organisations by providing the services of a ‘Competent Person’ under Regulation 7 of the Management of Health and Safety at Work Regulations 1999. As part of the service we will always ensure a competent and professional approach to the management of health and safety issues and have extensive experience of working with a wide range of clients in providing support and advice on all matters of Health & Safety and associated legislation. Our Safety Advisory Service can also be used to help organisations demonstrate their competence and commitment to health and safety, when applying for work on local authority tender lists; when making applications; and when pre-qualifying for work with larger contractors. In fact by subscribing to our Safety Advisory Service, you may secure new and larger contracts as a direct result of your commitment to health and safety. Many clients, especially local authorities, government departments are now demanding that as a company you must be able to demonstrate your competence through schemes. It is also the case that independent advisors usually have more credibility within the workplace. Employees also feel more confident that you are really looking after their health, safety and welfare. UK Safety firmly believes in a partnership approach to consultancy, working closely with the relevant people towards a specific goal. We are firmly geared up to meeting your needs. For a one-off, annual fee, our Safety Advisory Service includes the provision of a health and safety ‘Competent Person’, advice and support service to enable you to deal with complex health and safety issues quickly and professionally. 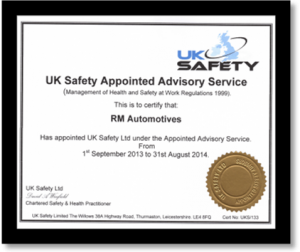 Provision of a framed Health and Safety Membership ‘Certificate of Appointment’. This service can be extended for a given number of days per year for premises and site visits.